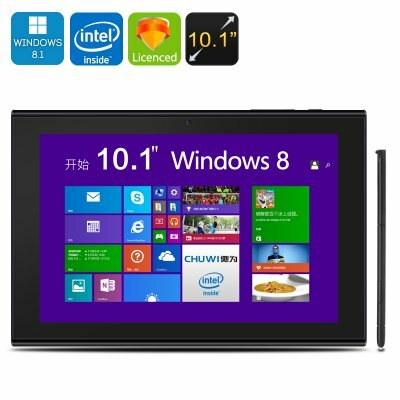 Successfully Added CHUWI eBook Stylus Tablet - 10.1 Inch Screen, Windows 8.1, Quad Core CPU, 2GB RAM, Bluetooth 4.0, HDMI to your Shopping Cart. The CHUWI eBook Stylus Tablet is a great tool for reading, working and entertainment. It comes with a large 10.1 inch screen and a black stylus that conveniently hides on the side of the screen. Large yet portable, the CHUWI eBook Stylus Tablet offers you lots of space and great media quality. Upload your whole library and read to your heart’s content with on the large 10.1 inch capacitive display with 1280x800 resolution. The tablet runs Windows 8.1 with Bing, so you will have a great operating system at your service with familiar interface and easy navigation. There is an include stylus that makes navigation and taking notes easy and when its not in use it slides away into a hidden slot on the side of the tablet. The Windows tablet sports a quad core processor and great connectivity. You will have Wi-Fi and Bluetooth 4.0 for efficient wireless communication as well as USB ports, SD card slots and HDMI (so you can hook up your big tablet to an even larger screen for the full media experience). The CHUWI eBook stylus tablet comes with 32GB of internal memory and you can expand that with up to 32GB more on an SD card. The massive 8000mAh battery gives you up to 7 hours of continuous playback and over 72 hours on standby. So you will have plenty of juice to play games and watch videos. The tablet even supports 3D gaming and comes with Intel HD Graphic Gen 7 GPU - so you will have a portable entertainment center at your service at any time. The CHUWI eBook Stylus Tablet comes with a 12 months warranty, brought to you by the leader in electronic devices as well as wholesale Windows tablets..